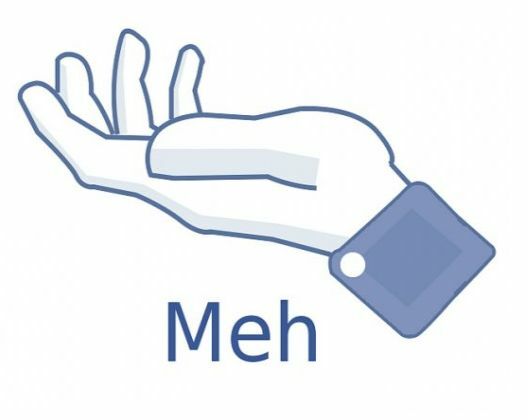 The Big Facebook Revenue Yawn. Yeah. 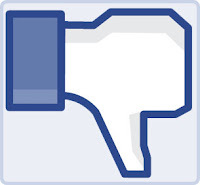 Facebook is IPOing. The words of one of my mentors sum it up best: "meh." Morgan Stanley, Goldman Sachs and other Wall Street friends will undoubtedly have pre-sold enough shares (to quasi-informed dentists and doctors who want to be part of the "next big thing") to make sure that the stock goes up at IPO time (See a really interesting post on a related topic here: http://youarebeingmanipulated.com/pyramid-root-manipulation-part-3/). Today, I'm going to make a back-of-the-envelope case here that the revenue side of Facebook ain't anything to get anybody excited about. When reality sets in, I'll bet that the stock heads south. The Wall Street Journal reports that in 2011 Facebook had revenues of about $3.71 billion and profits of about $1 billion. That's about 26% margins. Not bad at all. But with a $75-100 billion dollar IPO valuation, Facebook would be priced at 75 times trailing earnings and about 20 times sales. In other words, there are massive expectations for revenue and profit growth. Where does this revenue come from? 3. 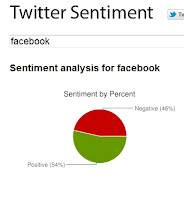 Sentiment analysis for companies. 4. Revenue shares from Zynga Farmville type applications. 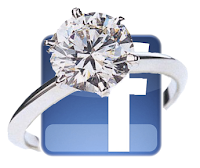 Advertising constitutes the biggest chunk of Facebook revenue. But how much growth is in advertising for Facebook? Not a lot for two reasons. First the Facebook user base is not going to grow much more and secondly, there are much better vehicles out there for brand builders. Let's go to the first point. 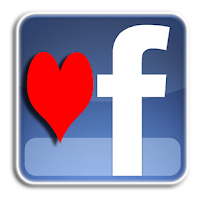 Facebook has 850 million users. That's tremendous. But lion's share of global Facebook accounts has already been had and it is unlikely that high growth will come from new Facebook accounts. More certainly, the consumers with the most desirable income levels (which is important for advertisers) already have accounts. All of this to say, that advertisers have already absorbed/reflected on Facebook's audience size/desirability and have signaled how good Facebook is as an advertising/brand building vehicle. That amount is $1.9 billion. But, its hard to see how user growth factors can support the 8X or 10X ad revenues (and profits) that Facebook needs to support its proposed $75-100 billion valuation. But wait a minute- perhaps Facebook users will spend more and more time on Facebook - giving advertisers better advertising opportunities. Evidence here suggests the opposite. Most users are most active when they first activate their accounts- adding friends, tagging pictures of themselves with their crush, or confirming Aunt Edna is their aunt. After that, the usage curve (for most) drops off and Facebook's functionality increasingly is geared towards messaging friends. Facebook came in 2nd in a advertising beauty prize, here is $10. B) On Google where the same young woman enters a key word search "wedding dresses in Boise"? Google (and other online sites), simply has a better venue for targeted advertising- and that's what advertisers want. Facebook may have some excellent brand building opportunities via social networking (which is more viral but doesn't deliver advertising revenue) but it is clearly in a lower tier for generating ad revenues. Facebook's runner-up position in advertising reminds me of the old Community Chest Card on Monopoly. Facebook's plans call for growing a classified sales in its Marketplace. This puts Facebook in Craig's List's domain. But here's the question: If I have an old table to sell, where do I have a better chance selling it - among my group of friends (or network of friends' friends) or via the site dedicated of bringing a much larger group of buyers and sellers together? For most items, Craig's List (or the online version of the local newspaper) gets the nod. There's revenue in the Marketplace for Facebook, but its not going to dominate the online classified section anytime soon. One of my academic research involves how managers measure their brands. One of the findings is how managers are increasingly measuring their brands online- and how they should be (so many do it wrong). Some brand managers track how many Facebook users "like" their brand. Others perform Internet sentiment analysis. These are important additions to a manager's metric tool box. But, is there really a lot of revenue out there for Facebook in this domain when there are dozens of free sentiment analysis tools like Rankspeed, Twendz, and TwitterSentiment out there? As an aside, I did some Twitter sentiment analysis on Facebook today. 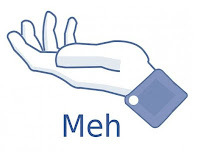 The online sentiments about Facebook are pretty much evenly split between positive and negatives. That ain't too good. Farmville was a revenue bonanza for Facebook. According to the Facebook financials, revenue share from the game's transactions represented around 13% for Facebook. But will Facebook be able to replicate successes like this? So far no other application has been anywhere close to capturing the imagination of the maturing Facebook users like Farmville did. The fear is that the Farmville-type revenue stream may be closer to a one-hit wonder than a reliable ongoing revenue stream. The point of this blog is not to trash Facebook. Facebook is a strong brand that has had amazing growth and a fascinating history. Even if a small percentage of 850 million users are lovers of the brand (Brand Mojo ratings on Facebook show that about 13% of respondents love the brand), Facebook will play a powerful role in shaping the online world in the foreseeable future. But when you break down the revenue side of Facebook's business, it doesn't look very exciting- certainly not at the level that deserves a market capitalization greater than Disney's or equivalent to McDonald's or Pepsi. When reality sets in, I'm betting most of the doctors and dentists will be wishing that they didn't buy the stock. Tourism is big business. About 1billion people travel to a foreign country each year and spend around 1 trillion dollars. Little wonder why so many places compete for a share of the pie. 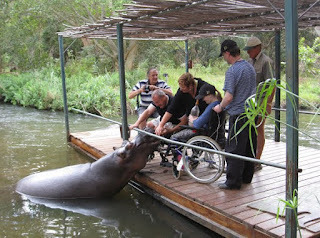 There is, however, one large segment of travelers that is often overlooked: the physically disabled. Let’s look at the American market. There are around 55 million people with physical disabilities in the United States. That's around the population of Texas, Michigan, Georgia, Colorado, and Arizona combined!) While people with disabilities are not a homogeneous group (disabilities vary in severity and condition- some involve hearing,others motion, for example) , they do share a common need: additional/special services. The segment also seems to be a large market willing to spend on services. According to a recent Harris Poll (conducted in conjunction with the Open Doors Organization and the Travel Industry Association of America), the 50 million Americans with disabilities have a combined income of more than $175 billion. In 2002, the American disabled segment represented 32 million trips and spent more than $13.6 billion on travel ($4.2 billion on hotels, $3.3 billion on airfare, $2.7 billion on food and beverage, and $3.4 billion on retail, transportation, and other activities). This study suggested that these travelers would double their spending if some minor amenities were made available. Meet and greet programs at airports, preferred seating on airplanes, hotel rooms closer to amenities, and employees who go out of their way to accommodate guests with disabilities topped the list. Demographic trends also suggest that “people with disabilities” is a rapidly growing segment. Here’s one obvious reason. As the large Baby Boomer population races into its golden years, more and more Boomers will be faced with mobility challenges. It is easy to see how Boombers with disabilities stemming from conditions like arthritis will seek warm travel destinations- increasing the total amount of disabled tourism spend. This leads me to my main point: Let’s say there are 2 very similar Caribbean destinations. Both places are appealing to travelers: terrific weather, inviting hotels, soothing beaches, hospitable populations, and similar currency rates. But one destination markets itself as more accessible (and encourages its hotels, restaurants and airports to make the necessary changes). This accessible destination would be better able to tap the large disabled market and likely see a sharp rise in its tourism dollars. It wouldn’t be the first time accessible changes have had an impact. On a micro level, for example, Scandic Hotels, a chain with hotels in Sweden, Nordic and North European countries in 2007, gained 15,000 extra overnights from accessible rooms. That’s great results that happen because of smart marketing. During a trip to Peru this summer, I met a peculiar young man named Ryan Coelho. He was a “brand guy” who told me that each person is a brand. From our conversation, I took away this: a person’s name represents who that person is- what makes him/her special and unique. The idea that people are brands has been around for quite a while. In 1997 Fast Company dedicated a feature story to A Brand Called You. Personal Branding has its own Wiki page. Examples of how to brand people are present all over the Internet. A person’s online image doesn’t solely depend on what he/she publishes, but also depends on what others publish about him/her. The point is you can’t control what others say about you, no matter if it is positive or negative. Articles, videos, pictures posted by friends and comments about an event or a relationship may all be available online about you even if you are trying to be low-key on “social-media.” I believe that each person is better off to publish information to help control his/her online personal brand. But what information should be published? To me the best question to ask is: “If an employer was to “Google” your name, what image would I want to portray? What type of information would I want accessible?” Odds are if you are a young adult who is not actively posting professional information about yourself, information about your social life will come up. For those students who are soon looking for a job, it would be a lot better to have professional information posted. Reid Hoffman, founder of LinkedIn has an interesting quote about social media sites: “MySpace is the Bar, Facebook the Backyard BBQ, and LinkedIn the Office.” I agree with his point that each media has its own interests and not all social media are beneficial to your professional future. Limiting your digital presence is your choice, but I suggest, do yourself a favor and build your online brand online. Do you agree with my arguments? Have you started to personally brand yourself online?